Our client recently came to Degnan Design Builders, Inc. with a concern--and a challenge. Create a beautiful, yet functional, 3-season sun porch and prevent future water damage to their home. These clients had a full walk-out basement looking out toward a small river about 50 yeards away--a river with a propensity to overflow its banks during spring melting or times of heavy rain. Should the river ever flood to the point of reaching their home considerable damage could occur. A small outdoor patio remains under the waterproofed deck, adjacent to the 3-season sun porch. The deck provides a small overhang to prevent excessive heat gain during summer months while still allowing for sun rays to prenetrate deeply in the spring and fall. The deck was made into a "hot roof" ceiling for the patio by using 10" of dense-packed cellulose insulation. Foam insulates the floor slab and foundation of the 3-season sun porch in case of a future conversion to a 4-season sun room. TThese design and insulation techniques help to ensure the new 3-season sun porch and patio stay as comfortable as possible--for as long as possible. Installation of a glass railing from RailCraft Glass Railing Systems improved the main level views from the deck. Aesthetics were paramount--both from inside and outside the home. To comply with this request, full Mon-Ray Glasswalls windows were chosen to preserve the views from the home's lower level porch enclosure. The beautiful, functional 3-season sun porch features a clear-finished knotty pine on the walls and ceiling over top of brick that covers the foundation. A cove for rope lighting tops the patio doors. Wriing for a TV is present if ever desired. Tile, which was an afterthought added by the owner, finishes the floor. The owners report that on sunny days, even when the outdoor temperature is zero, the 3-season sun porch warms to 55 degrees. Sunny November days brought temperatures of 70 degrees! With two ceiling fans installed, the roof deck overhang and all the operable windows, the summer temperatures during construction allowed the 3-season sun porch to maintain a comfortable screened porch atmosphere, as well. To meet the flood damage protection challenge, Degnan Design Builders used strategies to prevent water from infiltrating the foundation of the home. Siding was stripped from the lower portion of the rear of the house, wood decking removed, and a new foundation was poured for the 3-season porch addition. As a preventative measure, a new concrete wall was poured against the existing wood-framed wall of the house to just below the height of the windows. A new deeper foundation was added for the 3 season sun porch addition so that the patio doors are protected from potentia flooding. Before the concrete was poured, a waterproofing membrane was applied over the wood wall, and again, a waterproofing membrane was sprayed on over top of the new concrete and wrapped around the end, tying it into the original foundation. 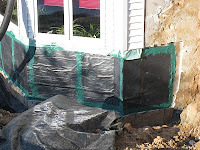 Thus, if water ever rises, it will be blocked by the new foundation and waterproofing membrane. Drain tile was installed on the interior of the new foundation and tied into the existing drain tile system. That original drain tile had drained to daylight and did not have a sump crock in the basement. The daylight drain was eliminated because in a high-water situation, it would actually allow water to flow backward into the house. Instead, a crock was installed in the unfinished basement with a pump draining to the side yard. This will relieve any water table pressure from underground and any water that may follow the foundation of the house in a heavy rain. The existing deck structure was re-used to become the roof of the room below. The shape was modified to create octagonal corners to flow with the theme of the octagonal dinette on the existing home. The next challenge was to waterproof this deck roof. Degnan Design Builders elected to treat it much like a shower, using Schluter products, with an exterior porcelain tile installed over a layer of cement board and 3/4" plywood. The multiple layers ensure stability to prevent tile or grout cracking and ensure a waterproof deck/roof surface for years to come. Repairs were made to the joist hangers and fasteners and a new beam system and posts installed over the new foundation to slope the deck surface away from the house for proper drainage of rain and snowmelt. The deck is unique and stunning with its glass railing and tile surface. The 3-seson sun porch adds diversity to the home, since it already has a sunny 4-season sun room on the main level. The homeowners are benefitting from peace of mind that their home is protected from flood damage as they enjoy the view from their beautiful, new 3-season sun porch.